In Tirana, Albania, cars are king. Pedaling my bike among dense vehicular traffic in this small country in the western Balkans, I switched into warrior mode. I was vastly outnumbered. It always amazed me that personal car ownership, now widespread, has only been a reality here for two short decades. During the communist regime, the roads were reserved for the vehicles of the ruling elite. Everyone else conveyed themselves by cart, bicycle, or foot. The regime fell in 1990, bringing about a pendulum swing of change. Albanians rushed to exercise their new rights: to migrate to the city, to own property, to start businesses, and to drive cars. Now, in the capital city, the streets are teeming. One rule governs the roads: the biggest engines make the rules. Pedestrians and bicycles are the new minority. We swerve and dodge our way through the unyielding vehicular chaos. As I made Tirana my home for a summer, I felt a new appreciation for the orderly bike lanes I had left behind in Western Europe. In this post-communist culture of car worship, I was even more amazed to find a small community of bike activism. Its nucleus is a group of three friends whose goal is to claim space and respect for bicycles on the road. Their businesses work symbiotically to make bike tourism possible for foreigners. 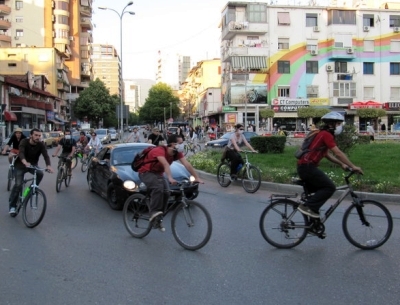 Gent Mati, Ilir Hysa and Edvin Parruca are also the organizers of Tirana’s Critical Mass bike ride each month. Edvin and Ilir opened Albania’s first hostel, Tirana Backpacker Hostel, in 2005. As the stream of travelers increased, they met demand by opening Tirana Backpacker 2 and a third hostel in the coastal village of Vuno. Meanwhile, Gent and his partner Laura Payne were growing an adventure tour business called Outdoor Albania. They specialize in rafting, trekking, and kayaking tours. 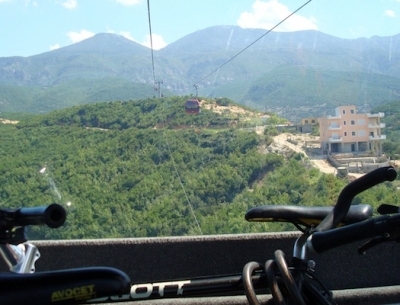 Given Albania’s road conditions, they had been hesitant to offer commercial bike tours. Albania wasn’t quite ready yet. Ilir and his partner Celeste wanted to change that. They envisioned an Albania that could meet the standards and expectations of the adventurous travelers who chose to visit. They founded the Outdoor Albania Association, a registered non-profit geared toward tourism readiness, especially in villages and rural areas of Albania. Their projects have included trail-building in the village of Pellumbas and historical landmark restoration in Vuno. Recently, Ilir and Edvin at Tirana Backpackers have teamed up with Gent at Outdoor Albania to offer bike tours to travelers. Over the summer, I got to sample some of the options for two-wheeled exploration of Tirana’s beautiful mountainous periphery. Conditions are still rough for cyclists in and around Tirana, but not impossible. Bikes are available for rent at the hostel, and day trips on bike are a compelling reason to stay in Tirana an extra day. The Mount Dajti Express and the Cave of Pellumbas are both better by bicycle, and if the timing is right, bike enthusiasts can even catch a Critical Mass ride in the city. My first bicycle adventure outside of Tirana was to Mount Dajti with two OA guides. Just 16 miles outside the city, the mountain is 5,291 feet high. Known as the “Balcony of Tirana,” it has been declared a national park. Just a few years ago, a gondola cable lift called the Dajti Express was built to carry sightseers from the city to the mountaintop. The best part of the gondola lift is that there is room for bicycles on board. We bought our one-way tickets up and climbed into the lift. At the top, we stopped for drinks at the Gurra e Perrise, a famous restaurant built around a panoramic view of the capital below. The restaurant has outdoor seating in lush garden terraces. Emerald infinity pools swarm with the trout that also appear on the menu, and lamb roasts slowly on its traditional-style spit. Inside the restaurant, the presidential table is reserved for political personages who bring guests to this little-known lookout above the city. About 17 miles southeast of Tirana, the village of Pellumbas and nearby cave are situated as the perfect day trip from the capital. The Outdoor Albania Association has done a tremendous amount of work readying the cave for visitors. They’ve made a safe and well-marked path, built a platform at the mouth of the cave for good access, and they maintain a Cave of Pellumbas website with directions to the cave and information. From Tirana, visitors can hire tour vans or find public buses to take them to Pellumbas. I prefer bicycle. Using the directions from the website and the bikes on lend from Ilir at the hostel, a friend and I ventured onto the highway due south. Edvin and Ilir initiated the Critical Mass ride in Tirana over a year ago, inspired by the scale of the monthly event in other European cities. Turnout varies, but the coordinators have come to expect 20 or more fellow cyclists on the last Friday of each month. They organize through an open Facebook group that currently has 293 members. 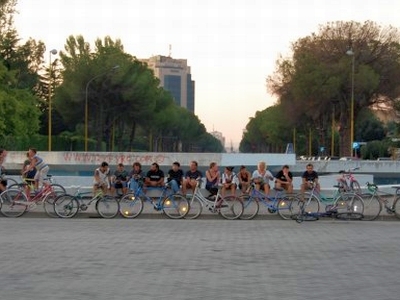 I joined the Critical Mass rides during the several months I lived in Tirana. We congregated at Mother Teresa Square, then banded together to traverse the city, our numbers giving us a little more assurance of our visibility and space on the road. After completing a degree program in tourism in Mallorca, Spain, Cynthia lived and worked in Tirana, Albania for the summer. She is now home in Denver, Colorado where she edits the TheTravelWord.com newsletter and works on her own blog CynthiaOrd.com.